Fossil Fuel Divestment In The New York Times! Student members of a grass-roots organization, 350.org, which focuses on climate change, participate in the worldwide day of action in Minnesota. SWARTHMORE, Pa. — A group of Swarthmore College students is asking the school administration to take a seemingly simple step to combat pollution and climate change: sell off the endowment’s holdings in large fossil fuel companies. For months, they have been getting a simple answer: no. As they consider how to ratchet up their campaign, the students suddenly find themselves at the vanguard of a national movement. In recent weeks, college students on dozens of campuses have demanded that university endowment funds rid themselves of coal, oil and gas stocks. The students see it as a tactic that could force climate change, barely discussed in the presidential campaign, back onto the national political agenda. “We’ve reached this point of intense urgency that we need to act on climate change now, but the situation is bleaker than it’s ever been from a political perspective,” said William Lawrence, a Swarthmore senior from East Lansing, Mich.
Students who have signed on see it as a conscious imitation of the successful effort in the 1980s to pressure colleges and other institutions to divest themselves of the stocks of companies doing business in South Africa under apartheid. A small institution in Maine, Unity College, has already voted to get out of fossil fuels. Another, Hampshire College in Massachusetts, has adopted a broad investment policy that is ridding its portfolio of fossil fuel stocks. But at colleges with large endowments, many administrators are viewing the demand skeptically, saying it would undermine their goal of maximum returns in support of education. Fossil fuel companies represent a significant portion of the stock market, comprising nearly 10 percent of the value of the Russell 3000, a broad index of 3,000 American companies. No school with an endowment exceeding $1 billion has agreed to divest itself of fossil fuel stocks. At Harvard, which holds the largest endowment in the country at $31 billion, the student body recently voted to ask the school to do so. With roughly half the undergraduates voting, 72 percent of them supported the demand. “We always appreciate hearing from students about their viewpoints, but Harvard is not considering divesting from companies related to fossil fuels,” Kevin Galvin, a university spokesman, said by e-mail. Several organizations have been working on some version of a divestment campaign, initially focusing on coal, for more than a year. But the recent escalation has largely been the handiwork of a grass-roots organization, 350.org, that focuses on climate change, and its leader, Bill McKibben, a writer turned advocate. The group’s name is a reference to what some scientists see as a maximum safe level of carbon dioxide in the atmosphere, 350 parts per million. The level is now about 390, an increase of 41 percent since before the Industrial Revolution. Speaking recently to an audience at the University of Vermont, Mr. McKibben painted the fossil fuel industry as an enemy that must be defeated, arguing that it had used money and political influence to block climate action in Washington. “This is no different than the tobacco industry — for years, they lied about the dangers of their industry,” Mr. McKibben said. Eric Wohlschlegel, a spokesman for the American Petroleum Institute, said that continued use of fossil fuels was essential for the country’s economy, but that energy companies were investing heavily in ways to emit less carbon dioxide. In an interview, Mr. McKibben said he recognized that a rapid transition away from fossil fuels would be exceedingly difficult. But he said strong government policies to limit emissions were long overdue, and were being blocked in part by the political power of the incumbent industry. Mr. McKibben’s goal is to make owning the stocks of these companies disreputable, in the way that owning tobacco stocks has become disreputable in many quarters. Many colleges will not buy them, for instance. 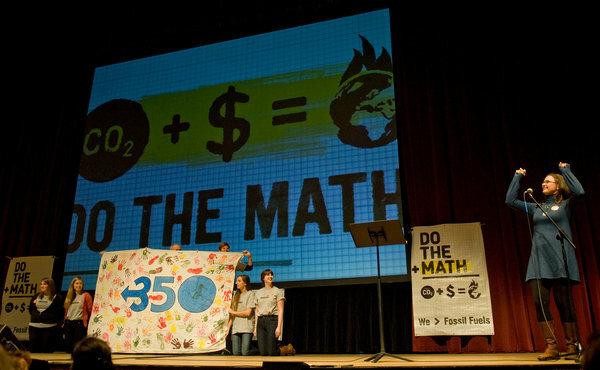 Mr. McKibben has laid out a series of demands that would get the fuel companies off350.org’s blacklist. He wants them to stop exploring for new fossil fuels, given that they have already booked reserves about five times as large as scientists say society can afford to burn. He wants them to stop lobbying against emission policies in Washington. And he wants them to help devise a transition plan that will leave most of their reserves in the ground while encouraging lower-carbon energy sources. “They need more incentive to make the transition that they must know they need to make, from fossil fuel companies to energy companies,” Mr. McKibben said. Most college administrations, at the urging of their students, have been taking global warming seriously for years, spending money on steps like cutting energy consumption and installing solar panels. The divestment demand is so new that most administrators are just beginning to grapple with it. Several of them, in interviews, said that even though they tended to agree with students on the seriousness of the problem, they feared divisive boardroom debates on divestment. That was certainly the case in the 1980s, when the South African divestment campaign caused bitter arguments across the nation. The issue then was whether divestment, potentially costly, would have much real effect on companies doing business in South Africa. Even today, historians differ on whether it did. But the campaign required prominent people to grapple with the morality of apartheid, altering the politics of the issue. Economic pressure from many countries ultimately helped to force the whites-only South African government to the bargaining table. Swarthmore, a liberal arts college southwest of Philadelphia, is a small school with a substantial endowment, about $1.5 billion. The trustees acceded to divestment demands during that campaign, in 1986, but only after a series of confrontational tactics by students, including brief occupations of the president’s office. The board later adopted a policy stating that it would be unlikely to take such a step again. About a dozen Swarthmore students came up with the divestment tactic two years ago after working against the strip mining of coal atop mountains in Appalachia, asking the school to divest itself of investments in a short list of energy companies nicknamed theSordid 16. So far, the students have avoided confrontation. The campaign has featured a petition signed by nearly half the student body, small demonstrations and quirky art installations. The college president, a theologian named Rebecca Chopp, has expressed support for their goals but not their means. Matters could escalate in coming months, with Swarthmore scheduled to host a February meeting — the students call it a “convergence” — of 150 students from other colleges who are working on divestment. Students said they were well aware that the South Africa campaign succeeded only after on-campus actions like hunger strikes, sit-ins and the seizure of buildings. Some of them are already having talks with their parents about how far to go. Brent Summers contributed reporting from Burlington, Vt.